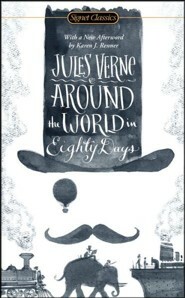 Jules Verne's masterpiece of adventure fiction that has captured the imaginations of generations of readers and continues to enthrall us today. On October 2, 1872, an English gentleman makes a remarkable wager: He can travel around the entire world in a mere eighty days. Thus begins Jules Vernes classic novel, which remains unsurpassed in sheer storytelling entertainment. Phileas Fogg and his faithful manservant, Passepartout, embark on a fantastic journey into a world filled with surprises, danger, and beautyfrom the shores of India, where the travelers rescue the beautiful wife of a rajah from ritual sacrifice, to the rugged American frontier, where their train is ambushed by an angry band of Sioux. With twenty thousand pounds at stake, Foggs mission is complicated by an incredible case of mistaken identity that sends a Scotland Yard detective in hot pursuit in what becomes a riveting race against time and an action-packed odyssey into the unknown. Jules Verne (1828–1905), born in Nantes, France, was the author of innumerable adventure stories that combined a vivid imagination with a gift for popularizing science. Although he had studied law in Paris, he devoted his life entirely to writing. His most popular stories in addition to Around the World in Eighty Days (1873) include A Journey to the Center of the Earth (1864), Twenty Thousand Leagues Under the Sea (1870), and The Mysterious Island (1874–75), all available in Signet Classics editions. In addition, he was the author of a number of successful plays, as well as a popular history of exploration from Phoenician times to the mid-nineteenth century, The Discovery of the Earth (1878–80). After a long and active career in literature, Jules Verne died at Amiens, France. Herbert Lottman, a longtime resident of France, was the correspondent for a number of American and British periodicals and literary magazines. Among his twenty-seven books are biographies of Jules Verne, Albert Camus, Colette, and Gustave Flaubert, as well as of The Left Bank: Writers, Artists and Politics from the Popular Front to the Cold War, The Purge (on postwar punishment of Nazi collaborators), and The Fall of Paris: June 1940, all published in both the United States and France. Karen J. Renner teaches American literature and popular culture at Northern Arizona University. She has published essays on the apocalypse, the Antichrist, horror films, and reality ghost-hunting television shows. She is the editor of The “Evil” Child in Literature, Film and Popular Culture, a collection of essays.